The permanent exhibition, which is housed in the same museum known for classic automobiles but in the upper gallery, has been open since February 2015. Students from all over the Bay Area have come to participate in very interactive activities led by trained, volunteer Gallery Guides of the Museum, who encourage the students to engage and answer questions about America’s settlement. The exhibit offers students and teachers an opportunity to witness a balanced view of the challenges, successes, and failures faced by both parties during the historical period in America. 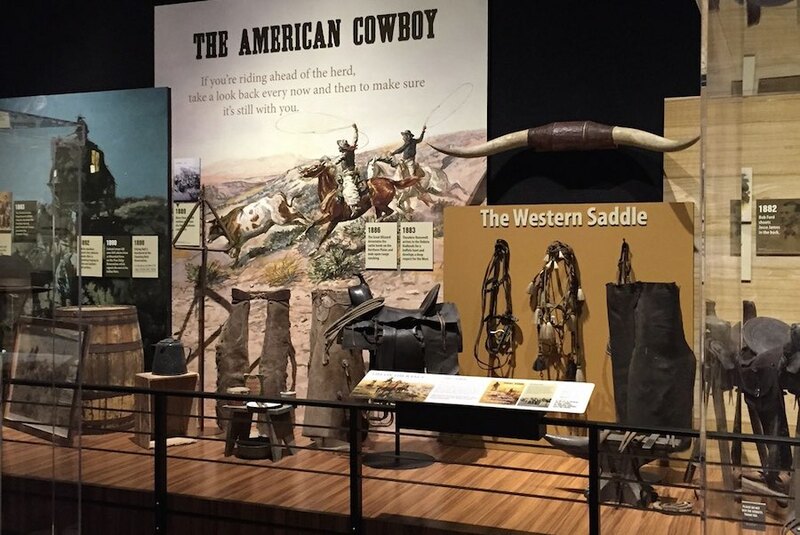 In order to help the Blackhawk Museums in its mission to provide formal and informal educational opportunities for K-12 school-age children and educators that engage, educate, and inspire them about history and culture, Studio Blue fabricated all of the signs in the Gallery. Working with artist, Berty Chang, Studio Blue, out of Pleasanton, California, produced the signs at the entry and back walls, the signage on the rails, and the signs hanging overhead. Studio Blue had its roots in Walnut Creek and has not forgotten its commitment to helping the neighboring communities. The Spirit of the Old West provided Studio Blue with an opportunity to not only contribute to helping students and teachers bring America’s story alive in person, but it also gave Studio Blue a chance to showcase their love and passion for working with artists and local businesses to create a product from start to completion. It’s a benefit to working with the local community that keeps Studio Blue committed to producing top-of-the- line, state-of-the-art products. Studio Blue is a full-service graphic solution and display company located that is dedicated to customer service and value. Family owned and operated since 1954, Studio Blue has continuously set the standard for Bay Area excellence from simple business cards to large custom trade show booths and anything in between. If you can imagine it, Studio Blue can bring your wildest concept to life. Please contact us for help with your design, graphics, or printing needs.